The line between what we do online and in real life slowly fades away. When it comes to locating a store or specific product or service, this merge between online and offline becomes more than apparent. It’s much safer for customers to check for prices and availability online, and then do the actual buying in person. The key to converting your online visitors into real customers is store locator software on your website. 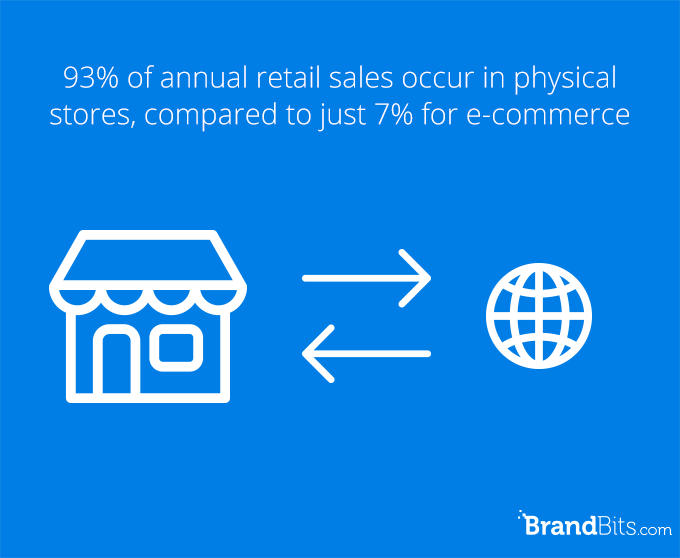 Recent consumer behavior study shows that 93% of annual retail sales occur in physical stores, compared to just 7% for e-commerce. It practically means that the real goldmine lies in guiding your online and mobile visitors to visit the physical stores. That’s where the most of the sales happen. Online presence is a good way to get discovered, but what is the most profitable for you is to increase foot traffic to your physical stores. And then, there is a store locator software that we want to discuss. It starts to makes sense, right? Store locator offers seamless way to find all the contact and location details right on the company’s website. It’s not even a question if you should use it, but how. The best thing about store locator is easy integration. Store locators are easy to create and implement into your website – SquareSpace, WordPress, Shopify, even a custom designed website. It has nothing to do with hours of coding or exploring functions you just heard of for the first time. In reality, integrating store locators into your website will take no longer than few minutes – just copying/pasting one line of HTML and very simple and straight-forward way of setting it up. If you have 30 more seconds to spare, you can set up a test store and see in real-time how easy and functional it is. 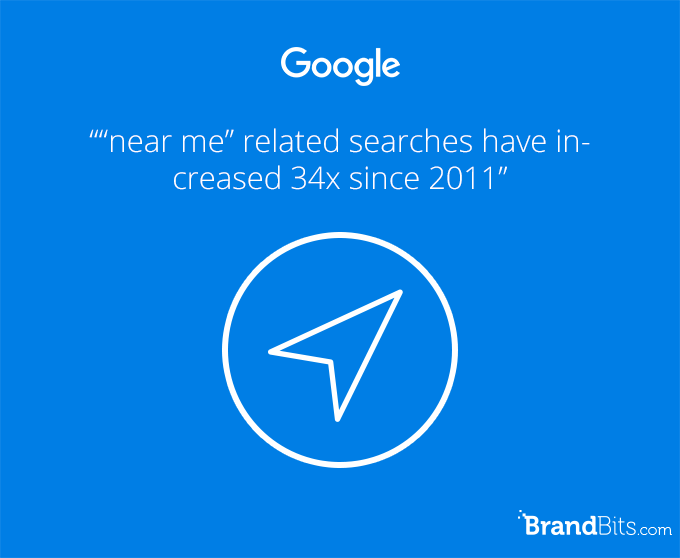 Google study from 2015 showed that “near me” and “near-by” searches doubled in volume in the past year. This value is not going to go down any time soon and, with the increasing use of internet and mobile devices, it could only skyrocket in the years to come. Besides conclusion that we should concentrate more on local marketing, this fact introduces another important factor that we must consider. 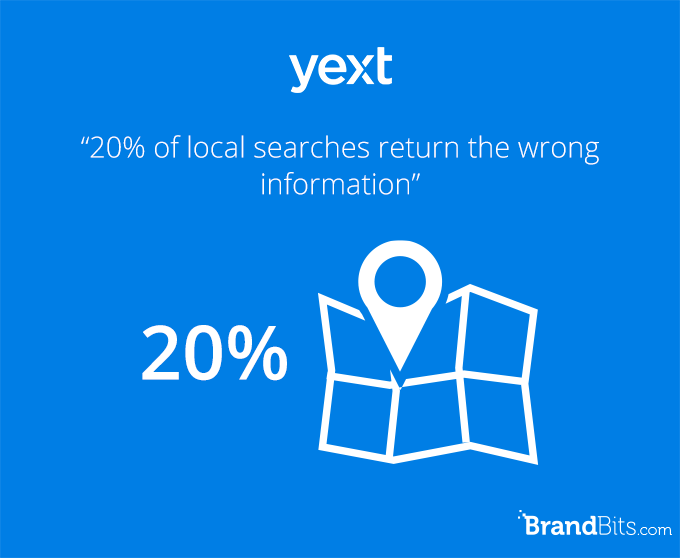 According to location management software company Yext, 20% of local searches return the wrong information. It’s happened to us all: you google a store or restaurant, and see that it’s open until say 8 p.m. You drive all the way across town just to find yourself in front of a closed door. Your time is irretrievably gone and you don’t blame Google, you blame the restaurant. How inconvenient. Incorrect info equals a terrible experience, and brands can not afford to lose customers because of Google. So, why don’t take the matter into your own hands? Provide accurate location, open hours and contact information right on your website, and don’t leave anything to chance. You will be in control of your location and contact details, and they will still be indexed in Google search. Only this time they will have accurate information that you’ll directly feed to Google’s search algorithms. Let’s not forget that your website’s bounce rate will be automatically improved when you add a store locator software, as your visitors won’t have to ask external sites for your locations. You can also get ahead by using integrated analytics dashboard to determine your audience’s preferences. By using website analytics smart, you can discover where you have the most demand, and expand to those places. According to another study by Google, 95% of smartphone users conduct local searches on search engines. 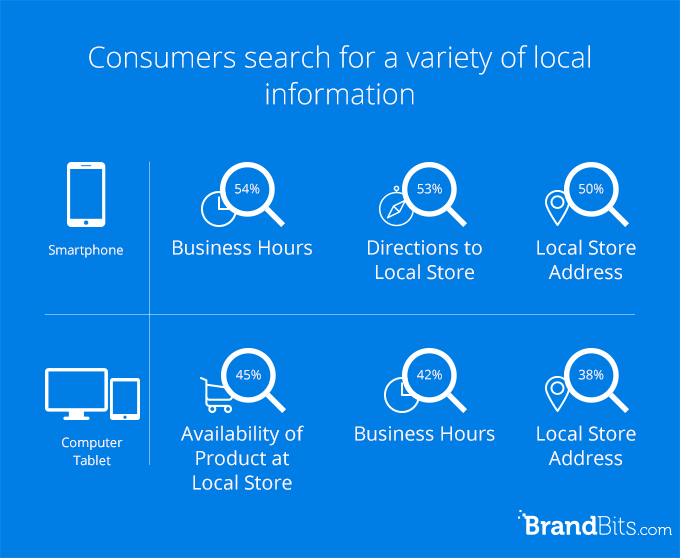 50% of these users who conduct local searches are most likely to visit the store within 24 hours and 18% of all local searches convert into a purchase. Feeling excited yet? You should, because store locator software works equally well across all platforms: mobile, tablets, laptops, and desktops! Integration will automatically recognize the device your visitors are using to explore and adjust resolution in order to provide seamless search experience. Ok, store locator software seems important, but why not just use Google Maps instead? We don’t really want to attack on Google – they are very talented people who are already making history. But what if there is a better, improved option for getting customers to explore your locations and services? Why not use it? While you can use Google Maps to search for stores either by name or address, you can’t use it to search for specific products and services. With custom designed store locator, visitors can filter the search however you choose to allow them – by products, features, services, open hours. The most important thing that custom store locator does better for you than Google Maps – it doesn’t display competitor’s locations. Also if your online visitors ask an external site for help, they might as well get in touch with some of the competitors while searching. Why risk it? If your customers search for locations on your website, you could serve them with some extra promotional information and features like limited time promotions, availability of the items/services etc. You could also include Streetview to give customers sneak peak into your store, parking availability and the surroundings. Of course let’s not forget that store locator on your website will represent your business in everything: brand colors, custom designed markers, layouts and themes. And it all adds up to user-friendly and productive online experience. In this big digital shake down that’s happening, some new trends of promoting started to stand out. One of the most promising is definitely omnichannel marketing. If you wonder what omnichannel exactly is, you’re not alone. The saddest thing is not that the regular people are not familiar with the term, but that many marketers are totally underestimating its importance. According to Deloitte, consumers who use digital while they shop in-store convert at a 20% higher rate compared to those who do not use digital. While we can safely say that store locators belong to digital, they are basically the touch point of all of these different sales channels, as they guide online and mobile visitors towards physical buying. And that right there is the very essence of omni-channel. There are plenty of store locators to choose from, but most of them fail to deliver smooth and simple search experience for the customers, which is their main purpose in the first place. Here is what you need to look for when choosing a store locator for your website, and some examples of brands doing it right. One of the most important things to consider, when making a store locator, is how the search is organised. If a tourist is looking for locations near him, prior to making a trip to the place where you operate, you need to make it easy for him to search for stores by city name, area and zip code. Not only one of the three. This may slip your mind, when specifically targeting local customers, but why lose an interested customer, who just happens to be in the area, because of some technicalities? Another helpful thing to enable is an autocomplete address entry. It gives your application the possibility to ‘’predict’’, so to say, the search entries before they are written. When a user starts typing an address, autocomplete will fill in the rest. Not necessary, but certainly helpful addition to any location search. Include search filtering for multiple services. Tesla, for example, really got a handle of this one. In the photo below you can see the results of their service locator search – not only that it’s easily readable and nicely organized, but it also includes recognizable markers for each type of service they offer. Zoom should be enabled as well as opening the whole map. Even though you may decide to provide driving directions and near-by markers, let the customers explore and decide how to find you. Maybe they want to zoom out and see the area, or zoom in and see near-by parking lot. Let the map guide the search experience, by allowing your users to find additional locations as they navigate the map. You can easily enable an event listener function on the map to show stores whenever the user pans or zooms the map around. This will create a more interactive and engaging experience for the user, without having to change search terms. Include links to store locator on other pages of your website where applicable. If visitors are looking at specific product page, let them see right there where is the nearest location that product is available. You can also enable GEO locating to detect the position of the user and display the closest location that offer that item. This will automatically relate to displaying your store locator page higher in Google Search results, when potential customers search for nearby locations or product availability. This is exactly what Urban Outfitters did on every product page, as shown below. 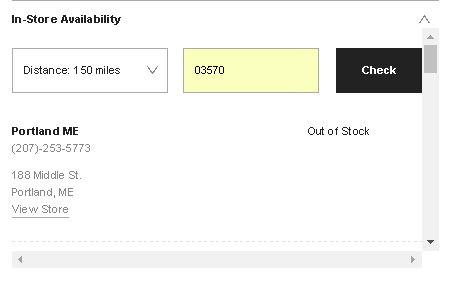 When you click on View Store, their store locator page opens, centered on the store you clicked with more details about that specific store. Good job, Urban Outfitters! For the areas where density of your stores/services is high, please think functionality before the numbers. It’s better to allow customers to explore the map without seeing overlapping markers, and make it easy for them to select whichever location they want. There is an handy option clusters that takes care of this. In the areas where you have a lot of markers in a tiny place, the map displays a cluster graphic with a number in it, which expands more only after zooming in. Take Petco for example. Very well organized map with multiple markers merged into one cluster for the radius that’s automatically chosen. Store locators come with numerous themes and options for custom design. Choose or make your own – one that resembles your website and business colors. You should make markers interesting but easy to read and find. Another good option is to have a pop-up window with description of store when someone clicks specific marker. The importance of visual factors in online marketing is a subject of its own, but let’s not forget its importance in all of your digital marketing efforts – store locator page being one of them. Final step that you shouldn’t miss out on is literally directing your visitors to your store. And not only writing the coordinates so they can use GPS on their own. Include written description, photos of store, even an audio copy to make it ultimately easy to find and recognize your store. Even better, use geolocating to learn the current location of each visitor and offer personalized direction from their location. If it seems this is bit too much of an effort for just offering directions, don’t worry. 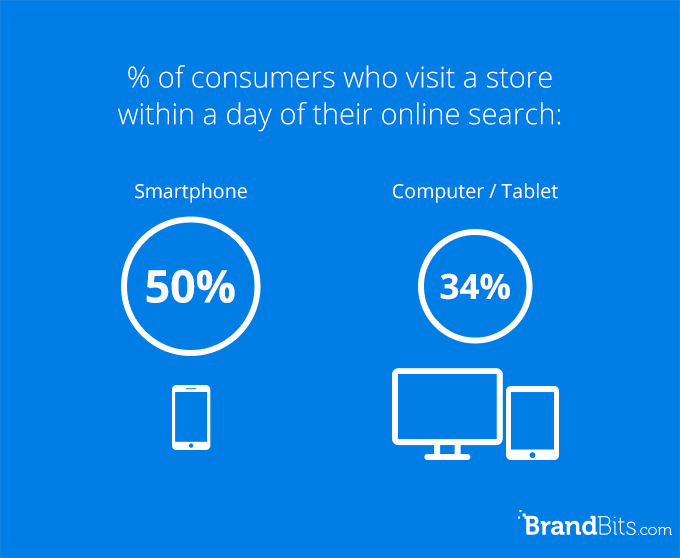 Brandbits store locator takes care of this automatically. In the end all your efforts are there for an ultimate goal – getting physical visits and winning more sales. 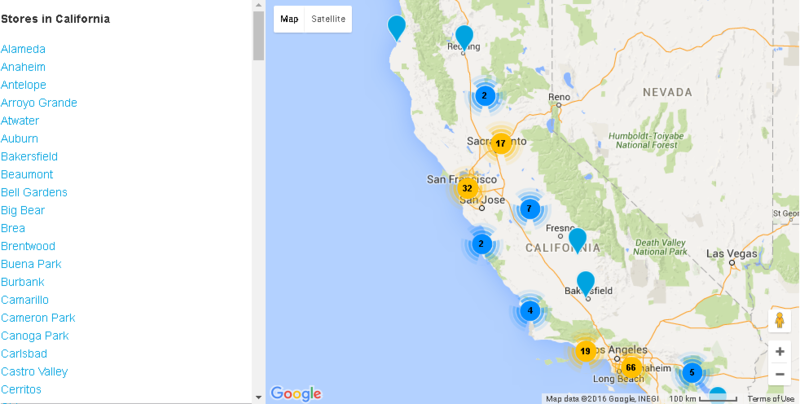 Should businesses, other than retail, use store locator as well? Of course. And here are few ideas of how to do that. 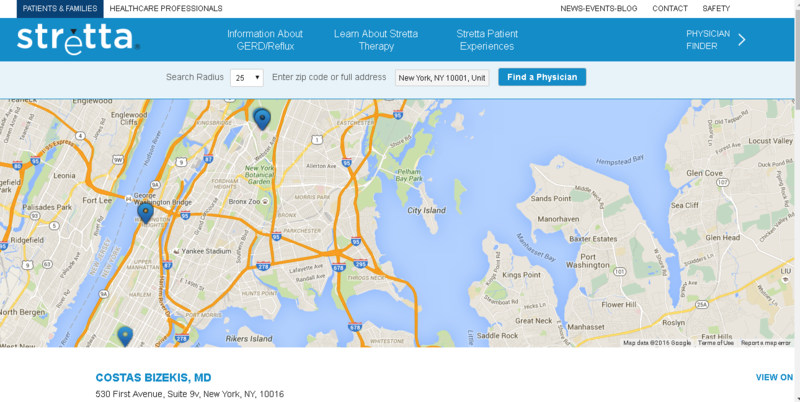 Stretta made a physician directory that could be searched via zip code, city name or doctor’s name. The results are displayed on the map, while complete list of physicians can be found just below. For financial services, ATM locator and/or branch locator could do miracles for customers in need. Take a look below to see how Visa is really rocking at this. JobKaster.com is basically a job board in form of interactive map, showing job listings for any desired location. Very innovative, very efficient! Another unusual way of using locator service is attorney finder. NACBA is one of the pioneers in this. They enabled search either by the state or by using built-in GPS positioning technology, to offer near-by lawyers. Although we showed these few as an example, opportunities for use of location search don’t stop there. You could, literally, use them for locating anything!